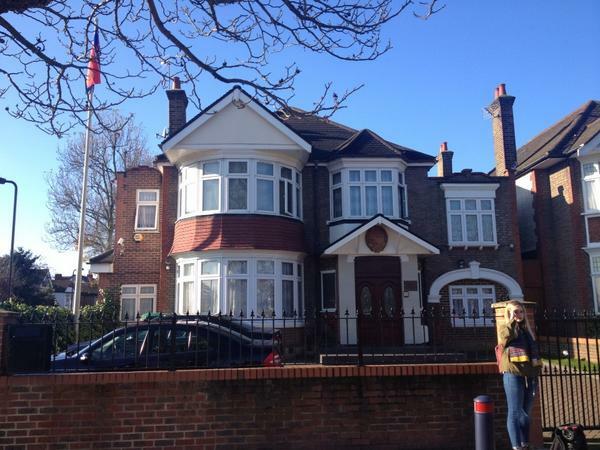 The embassy of the Democratic People’s Republic of Korea has sprung a creative ambush on its unsuspecting host community in sunny suburban west London. 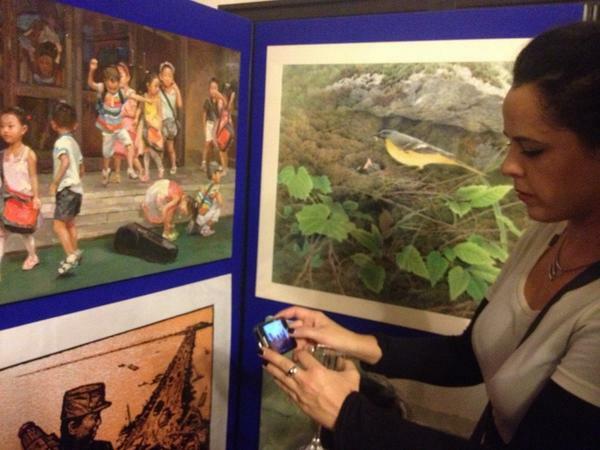 North Korea, better known to some as an impoverished neo-Stalinist gulag run by crazed human-rights-abusing dictator armed with a nuke, has opened its embassy doors to the British public so they can share the joy of one of the DPRK’s less-well-known exports: fine art. The fineness of the art is open to judgement; some is, technically, rather good. There are a couple of particularly striking wood-cut prints, including just one socialist-realist piece: my favourite. Tate members might consider some of the art a bit schmaltzy, other paintings clunky, or childish. Few, let’s face it, would get nominated for the Turner. But for all the absurdity and the earnestness of the besuited oil-painters (all displaying patriotic Kim family lapel pins), the exhibition – which opened this morning – is a first… in London at least. The paintings on display do not offer any real portrait of life inside the hermit state, but they might just represent a very slight crack in its heavily lacquered veneer. Only the work of a handful of artists from the 700-strong contingent of Pyongyang’s “elite” Mansudae Art Studio have work on display. And only four of those artists – all oil painters – have come to London, where for the past two weeks they have painted their way round the capital, visiting the South Bank, the National Gallery, Covent Garden and the Tower. Among them, team leader, Hong Song Il, a Mansudae “merited artist”, better known back home as chief portrait artist of the ruling first family of Kims. Mr Hong didn’t want to be drawn on that, preferring instead to focus on his London period. These include a painting of a snapshot he took of two smiling teenaged girls on the banks of the Thames and the ceramic poppy installation at the Tower of London. “I visited this site on my first day in London,” he told me. “I was very surprised at first that these were not real flowers. I did not know why they were there. But then it was explained to me and I realised it had a very deep meaning. His picture of the smiling girls was stuck to a display board which obscured a glass cabinet framed in beech veneer. Just visible on the top shelf: 49 volumes – with gold-embossed titles on navy blue leather – of Kim Il Sung’s collected works. They looked very new. Not well-thumbed. The point of the exhibition appears to be to forge a little more cross-cultural understanding and build a few bridges. But under the watchful gaze of Great Leader, Kim Il-sung and the late Dear Leader, Kim Jung-il (grandfather and father of the ruling Marshal Kim Jung-un) the artists all looked a bit awkward and stiff. Not exactly stereotypes of free-thinking creatives. Jon Pyong Jin (Merited Artist) – “a specialist in active brush-strokes and moderated colours” – had painted a slightly garish oil of Trafalgar Square… although he’d brought over some slightly more classically-styled paintings of life in Pyongyang too. 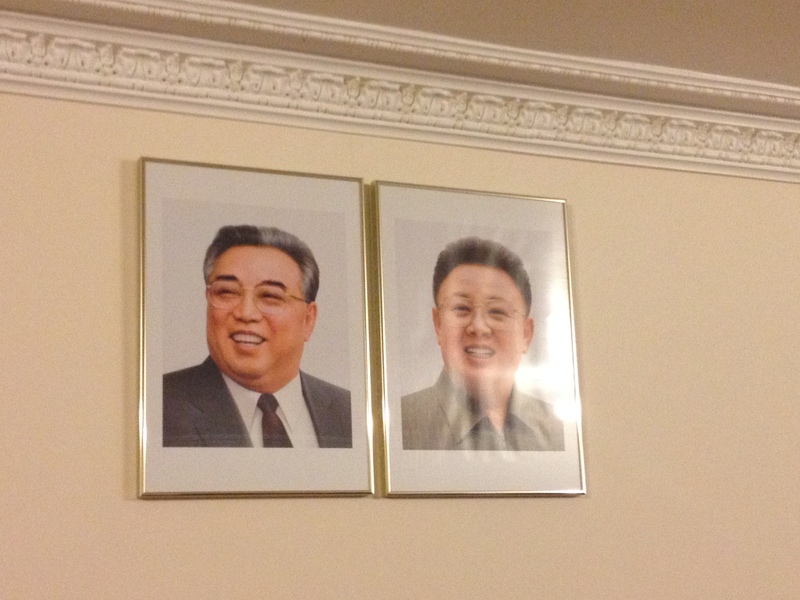 He wore a bright red lapel-badge with the smiling heads of the two elder Kims superimposed on an unfurled flag. 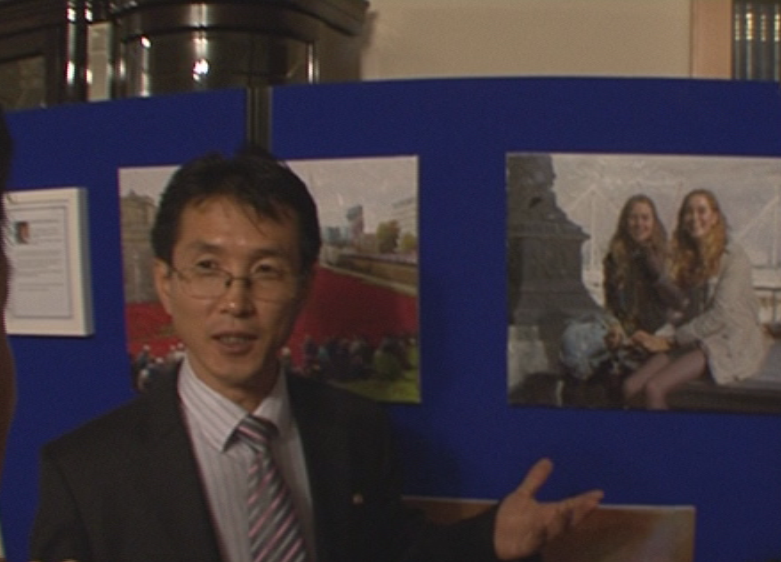 I asked him whether he was savouring of the freedom of being in London and whether this contrasted with life in the DPRK. I told him I’d love to come and thanked him for the invitation. The trouble is, that will prove a bit difficult just now as at the end of last week, the North Korean government informed every foreign embassy in Pyongyang that all foreigners visiting the country would be subject to 21 days in quarantine – regardless of their point of origin. This, it turns out, is because the People’s (not very democratic) Republic has caught Ebola hysteria. If the London embassy art exhibition is intended to entice tourists into visiting North Korea, the Ebola quarantine directive is a bit of an own goal. All foreign visitors will now be placed in isolation in what is already the most isolated country on earth. So if you’re thinking of hitting Pyongyang any time soon, my advice is to hang on for a bit. And while you’re waiting, pop into the inter-war suburban semi in Acton, west London, where for the next three glorious, revolutionary days, you can enjoy North Korea’s fine art at its finest.